Rod Stewart | My Things - Music history for those who are able to read. A nice article with a man who seems to be quite humble and down-to-earth, despite his success in two well known bands. This article should also be of interest for fans of The Who and Rod Stewart, I think, as Mr. Jones later replaced one of the very best drummers, Keith Moon, in the Who. Rod is mentioned briefly a couple of places here too. Of all the Faces, Kenny Jones is probably the most enigmatic character in the band. In the midst of the most rowdy, boisterous backstage interlude it`s always been Jones that sat quietly in the middle of it all never quite getting involved in the Faces` full repartee. As the Who have their Entwhistle, so the Faces have Jones – a kind of balancer that every band needs. A reliable solid entity. Consequently it`s doubtful that he`s ever had the real praise due to him as the fine drummer he is. Last week, in his manager`s office, a surprisingly relaxed, forthcoming Kenny Jones talked about his work with the Faces, on the Chuck Berry sessions and the resurgence of interest in the Small Faces. Let`s talk a bit about the old Small Faces. Do you think they ever got the musical recognition they deserved? Yeah, it had its heyday, you know, it had a climax to it. It went through a period when it was really top level but then it sort of slid off a bit. Do you think they were ever recorded properly? Yeah, I don`t think we were ever recorded badly. Glyn (Johns) was a great help. He did all the early stuff when we recorded at IBC, Pye, Olympic and he really had a lot to do with the sort of feel we got on the early records. Why was it do you think that the Faces as they are now had to go to America before things started happening? I think that was just because we weren`t working here much in the beginning. I mean we knew the band had a lot of potential and we wanted to get to the States to sort of get three months solid playing behind us just to pull us together. You know, every band needs that, especially if it`s a re-formed band like we were and it was important for recording, too. How did the first Faces rehearsals sound? I don`t remember, actually. I think they were probably a relief to my ear, I mean Ronnie Lane can sing and Woody can sing harmonies but they haven`t got that front liner sort of thing. Like, Rod can do that and he had no trouble in working himself into the numbers. At this time Rod was contracted to do the solo albums? Yeah, when I asked him to join he`d already signed with Mercury so there was a lot of business things to sort out because apart from Rod being with Mercury – we were with Warner Brothers – we still had all the old Immediate contracts to get out of and the whole thing was really involved. It took a long time to get round but Billy Gaff was the brains behind all that. Did the fact that Rod would be doing solo albums worry the band? Not really, because in the early days we tried to keep them separate. Like we`d play a bit rock and roll and Rod would do maybe some country things on his own albums but we soon forgot about all that. We just don`t worry about it now – it`s all the same group more or less now. It seems to take The Faces a long time to record albums. Any particular reason? Yeah, it does take us a bit of time to record. When Rod goes in to do his albums it doesn`t take long because everything`s always his own ideas, you know, and he just tells everyone what he wants and that`s it but when we`re ready to record like there`s five people who`ve got to have a say and that can confuse the issue, if you see what I mean. We have to scrap a lot of things because of that. I mean sometimes we go in with a set thing in mind and it`ll work but usually we just go in and have a little play and see what comes out. What`s been the easiest Faces` album to record? I think the last one was about the easiest. That album was a step in the right direction for us because we`ve still to come up one that really satisfies the group in every way. I mean it`s taking time because we`re still finding out about each other. See, if it was only one person giving the directions there`d be no comeback but as it is there`s five people still feeling each other out and trying at the same time to come up with a direction or feel which pleases everybody. Does Rod record the vocals separate from the backing tracks? Well, what happens is that when we do the backing tracks he puts on a rough vocal because it helps us to go along with it a bit more. Then he scrubs that out and comes in later and does his own thing. How much of a perfectionist are you when it comes to drum sounds? Well, actually. I have a good thing going with Glyn Johns because we both have the same ideas about how drums should sound. I mean we can talk to each other about drums and know exactly what each other means. With some engineers if you tell them what you want they get the needle but I always manage to come out of a studio after a session with a decent sound. How do you feel about the sessions you did in London recently with Chuck Berry? That was really good. I was surprised, you know, because we did the album at Pye and I`ve never liked the sound there but it sounded nice. I got a good sound straight off – I couldn`t believe it. I didn`t think too much of the other side of that album – the live side – but I suppose we had the advantage because we did it in the studio. It was a bit rough, you know, but it had a nice feel. I think we went in about twelve o`clock and came out about eight and everything was finished. In fact, he wrote some words there and then in the studio and there`s one song where he just sings “I love you” every few bars. That was a really loose session. Do you have trouble getting a good feel in a studio? Yeah. As soon as the red light goes on it just freezes me. You can be playing away quite nicely getting a number together and you think that it`s all there for the taking but when the light goes on something happens to you, I don`t know what it is but I think it`s something most people feel about recording. There are some people who just don`t think about it, though, you know they just play and let it come out. How would you feel about doing a full live album? Yeah, we`re going to do one probably after the new album we`re working on now. How do you feel about drum solos? I don`t particularly like them, actually. I mean the only thing I could do that comes near a solo on stage is “Losing You”, and even then I keep it really basic with a few little fiddley things on it but that`s about it really. Is Ronnie Lane the kind of bass player you work best with? Yeah. We`re very close. We`ve been together for so long, you know, playing with him is just very natural because he bought his first guitar when I bought my first set of drums and we`ve been playing together since. He`s great to work with because he`s very simple and punchy. I`ve got no complaints about Ronnie. British rock and roll rhythm sections seem to be much more effective than they used to be. Why do you think that is? I don`t know I think everyone`s just a bit more mature. People are playing a lot more simply and there`s just a lot less busy drummers around. I don`t really go out to gigs a lot but I know there are lots of really good drummers around, you know, just guys that I`ve met on our gigs. I`ve just got into a thing now where I just don`t worry about how good other drummers are, you know, I don`t want to copy anyone and I just play what comes off the top of my head. I mean I`ve always done that but more so now, like instead of thinking about the song whatever I just play along with the beat and keep it extremely simple – even if it means just hitting the bass drum. Would you agree that you personally reach a peak in your playing during a long number because it`s always struck me that you need to feel your way into a song to hit a good groove? Yeah, sure, I always play better towards the end of a number because I like to put a lot of sweat in. Like, when I`m really tired that`s when I start to play extra hard and really begin to push. It`s something I`m not conscious of at the time, though, Ronnie (Lane) is the same. Have you ever felt that you`ve been playing too much and that your style needs pruning? Yeah, there have been times when I`ve felt that. See, as I say, I`ve always tried to be a simple drummer but I`ve had the odd gig when I go on and I get so excited and wound up that I`m just hitting everything in sight but then I think, before anyone tells me, what the hell am I doing and then I begin to lay back. The important thing is, though, that I know when I`m playing too much, I can recognise it. That seems to be a very British thing among drummers. Yeah, right. Like every bar is a fill in. Some of the soul drummers like A 1 Jackson with Booker T and the MGs are incredible it`s just straight swing all the time. What similarities, musically, do you feel between this band and the Small Faces? I don`t think there are any real similarities. Although it`s got the same name it`s completely different. Even when we formed, this is a thing a lot of people don`t realise, although there was three of us in the old band it was a completely different thing. I didn`t even know what Mac was all about when he was playing organ then, really, because we all played differently and we were feeling each other out as a new band. It was just the same as if we`d never seen each other before. But, basically, the only similarity I`d say would be that Mac, Ronnie and myself were still that little rhythm section tightening things up. There seems to be a lot of interest in the old Small Faces in the States now. Yeah, they`re re-releasing all the old records. Like “Ogden`s” been re-released and all the early stuff – I don`t know where the F–ing money is, though. Do you share the opinion that “Ogden`s Nut Gone Flake” was the best Small Faces album? Yeah. The two albums I like is the very first one we ever did, I think it was just called Faces or Small Faces, and “Ogden`s” and then there were a few tracks on other albums that are good but, basically, these are the two I really liked. How do you find touring in the States? Well the first tour we did there was bloody long – something like three months – but that was the one that really broke us and I enjoyed that one. The rest I haven`t particularly enjoyed. I enjoy playing for the audiences but I don`t like being in the States because I get very homesick – I think the rest of them do too. We just love to get back home. How do you feel on the road? You get bored. I mean hotel rooms are about all you see. You`ve heard it all before but it`s true. The only good thing about it is the television and the few friends we have. When`s the next American tour? I`d say in about four months because we`re having a bit of a break now. Well, actually, it might be six months because we`re doing Japan first then on to Australia and New Zealand. We did Australia with the old band and that was really funny, it was a laugh because we did it with The Who. It was quite interesting, though, just playing to different audiences. I read somewhere once that Ronnie Wood reckoned the band`s drinking was getting out of hand on stage. Oh yeah. Well it still does, really. I mean we all drink wine – except for Mac – but Rod`s THE wine drinker. But it does get out of hand, especially if we get to a gig really early and you just go into the dressing room and start knocking it back. Alcohol really slows me up. Dope? That doesn`t affect me too much. I mean I`ll have a little blast now and again but even then that`s not too often. But that`s just me, you know. Dope used to be nice in the old days but you sort of grow out of it. Getting back to America, how much stuff have recorded there in the past? Well, we`ve done a bit but not too much. Like, I can`t see why people go on about studios being different between the States and here because all studios are the same to me. I mean over here in Olympic you can get a good band sound all round but in the States you get one studio that has a good drum sound but a pony old guitar sound and another one will be exactly the opposite and it`s all like that. I think probably from what people have told me – there`s a better brass sound in American studios but that`s about all I can say. How do you feel about The Faces` open air Festival gigs last summer? I like festivals on a small scale. I don`t like millions of people all over the place because then it just becomes a shambles, you know what I mean. I think we did about three – the Great Western, Reading and another one. I didn`t like Reading and the Great Western wasn`t much good either because we felt we just weren`t getting across to the people. The ideal size for a festival is about five to eight thousand people, I mean that`s plenty. If it`s a big festival there`s only a small proportion of the whole audience who you can actually play to – the rest of the people see you as little specks on a stage miles away. What about concert audiences. Do you find English audiences more relaxed than in the States? I think they probably are but I think basically they`re the same as far as this band`s concerned. There was a time in the early days when there was a difference but I think it`s just that the young people in England have caught up with the American kids – or the other way round, whatever way you see it. It just happened that we broke in America first because they kind of adopted us if you like, but it was an unconscious thing on our part. How do you see the business side of rock and roll? Well, it used to give me headaches in the beginning. I mean we had so much trouble in business things with the old band that it sort of wakens you up to that side of it. There`s so much I know about the whole business thing now, in fact we all do, because we`ve all been screwed out of money at some time or other. Like, we all know exactly what a good contract is just by sitting down and looking at it rather than like in the old days it`d just be mumbo jumbo and we`d send it to a solicitor and let him see what he thinks. But now we`re probably more up on it than the solicitor. I think it`s a good thing for a band to take an active interest in what`s happening to the money. When you do a gig you`re quoted a price and get the price but then you find out, you investigate, exactly what they`re charging on the door. We tell the promoters in the States what to charge for concerts and it works out at around an average of two dollars and certainly no more than five. If you get someone screwing kids out of money they won`t get slagged off, it comes back on us. It don`t make you feel good when you arrive at a gig and there`s people standing outside who can`t afford a high admission price. It`s kind of sour. This number of Sounds also contains articles/interviews with these people: Ginger Baker, Johnny Nash, Wild Turkey, David Bowie, Linda Lewis, Osibisa, Lesley Duncan, Yes, Plainsong, Yes, Ian Carr, Mike O`Shea, Lou Reed, Bread. 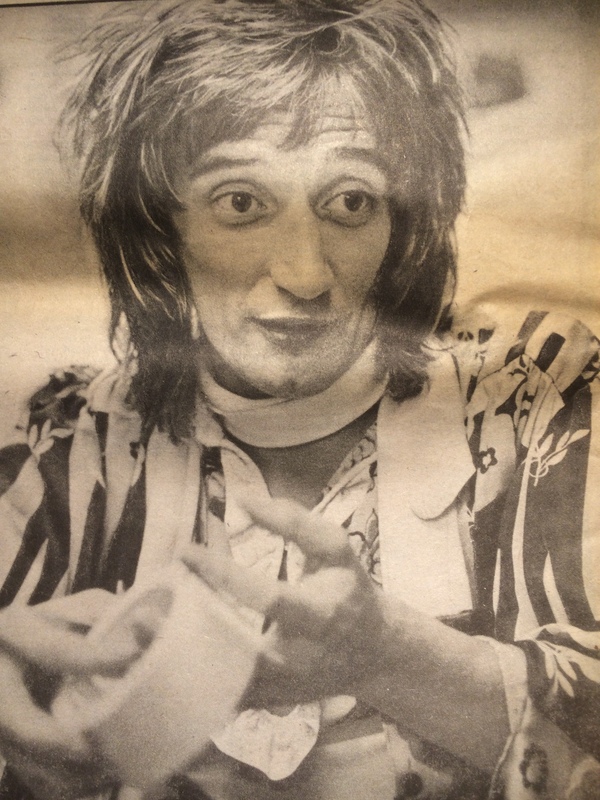 I haven`t printed any articles about Faces or Rod Stewart before. Time to change that, as Rod was a rocker at the start of the 70s. Quite an interesting article, especially seen in the light of today. Have a nice read! Rod Stewart ruffles his hair, gazes down thoughtfully at his red patent-leather shoes. It`s early evening in an office above Wardour Street and, a floor below, the Marquee Club is just warming up for the night. Thick, muddy, distorted rock seeps up through the floorboards. In some respects the early days must have been great for Rod Stewart and the Faces, when they used to play places like the Marquee. Admittedly there are few guys around who seem to enjoy the flash of success more than Stewart yet, in some ways, life must have proved much easier then. Certainly less complicated. Just sometimes Stewart must wish he could get back to that, especially over the last six months when one could hardly blame him if he occasionally felt a little desperate. On their last British tour the Faces were roundly criticised for sticking too closely to their old material. Then Stewart was quoted as saying he thought “Ooh La La” was a mess. And now, for whatever reasons, Ronnie Lane has left the band. So here he is tonight, forgoing an invitation to a fashion show at the Savoy to put the record straight. He speaks cautiously now. Despite his brash, arrogant onstage persona he`s a guy with sensitive spots like any other; edges and sides that have sometimes been hidden behind the boozy, outgoing exterior. Even so, tonight, he`s content with the world, and perhaps rightly so. Over the previous weekend the Faces had played a series of heartening concerts at the Edmonton Sundown. On two or three of the nights they had been ace, simply tremendous and Stewart knows it. If the band have been through a bad patch just lately it now seems over. He doesn`t put one completely at ease, stretching back smiling and saying “Well, what do you want to know James?” but he`s a likeable soul, a little more homespun than sometimes presented. He sips a pint of bitter and starts to talk, firstly about Tetsu. “It was either going to be Andy Fraser or Tetsu. Tetsu was the first we asked and he jumped at the idea. We were a bit wary at first `cos we`re really quite close to Free, not so much as friends but we really love their music and we didn`t want to bust their band up. “It was Simon who said it`s brought the two bands together – which it has. Free`s music is maybe more of a down type of music than ours but there`s a similarity. We tried one other guy who was brilliant but not as good as Tets. “He`s just the right shape y`know,” Stewart rubs his hand down his hip. “He`s got a tiny little rib cage and little spindly legs and his guitar kind of fits in the middle. “The first night he came he brought some scotch with him. I don`t think he`s ever drunk so much in his life till that night. Now every time I see him there`s a bottle of scotch sticking out of his pocket.” Stewart laughs in satisfaction. He moves on to explain how it`s good to get some new blood in the “orchestra”, and he`s looking forward to getting Tetsu on stage. But hadn`t Ronnie Lane`s increasing interest in Meher Baba – and perhaps his more homely approach to life – meant a certain contradiction of life-styles within the band? Stewart draws up his shoulders slightly. “Let`s get one point clear: we`re all parting on the best of terms. Let`s get that on record, there`s no bad feelings. “If you look back at the interviews I`ve done since we first got together, I`ve always said Ronnie Lane is one of the best lyricists Britain`s got, and he still is. He`s got a great career ahead of him. “I think he probably just got tired of being on the road, which I don`t really blame him for. It was just at a point, though, when the rest of us were really getting into doing it on the road. Y`know, we love it now – me, Woody, Mac and Kenny – we love being on the road. But I don`t think Ronnie did. Fair enough. But, just to check it out, how about the old rumour that Rod`s thinking of leaving the band? That he doesn`t need the Faces as much as the Faces need him? “Well, I don`t know whether they need me but I know I need them. If something was to happen I could always make my own albums, but I`d be lost without them. “I don`t expect, though, to sustain the same level of success for ever. Name somebody who ever has. Everybody has to level out and I can`t expect to have another album as successful as `Every Picture Tells A Story`. That was a freak album. It sold a ridiculous amount of records. Stewart says there`s a peak he`s aiming for – records and concerts that he`s totally satisfied with. “When that happens I`ll retire – I`ll knock it on the head. “I look at it like all good footballers should – I want to retire at the top. It doesn`t tend to happen in this business and it`s sad. People just sink lower and lower and hang on to the music business. So what does he feel is still missing from the albums? He emphasises it. “We can do a better one and we`re going to. “Oh, I don`t know because last time I said that with `Amazing Grace` everybody else went ahead and did it and beat me to the punch. These days I keep the songs I want to record up my sleeve. Is there any more he`d like to say about it? Stewart considers. “Well, I`ll probably use the same crew…yeah, I think I`ll use the same crew. And there`s a strong possibility it could be the last one. “In future I think we`ll combine the two – my albums and Faces albums – so I can put one hundred per cent into both. I think that`d be a good move. “Then I`ve got this album which is a kind of `Best Of` coming out in about four weeks time which I`m really pleased with. I went to the trouble of re-mixing some of the tracks and cross-fading some of the others. 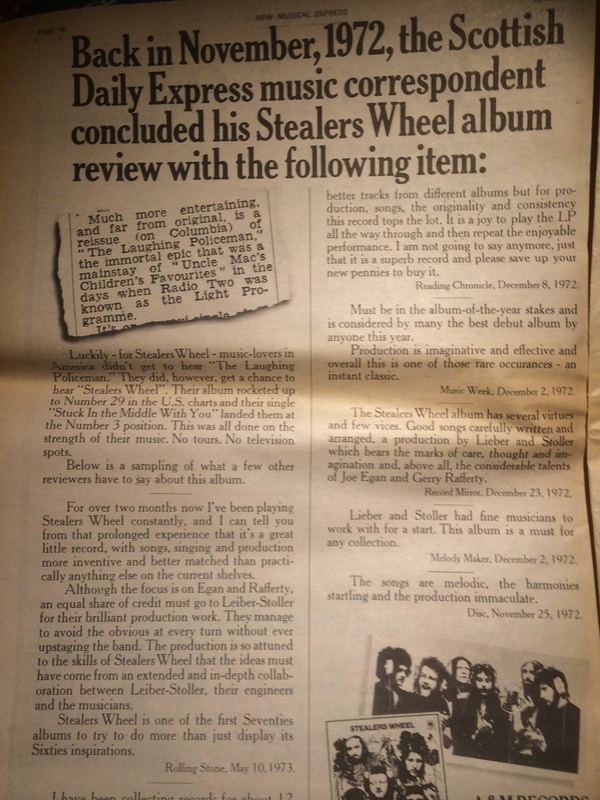 I`m glad the record company had the courtesy to ask me to put it together myself. He gazes at the floor again, then perks up. “I`ve got more guitars than I know chords. Did you know that? I`ve been collecting acoustic guitars lately and I worked it out the other day that I own more guitars than I know chords.” He looks pleased. Stewart smiles and talks about football for a while. He says he`s still allright as a player but finds it hard to get a game without attracting vast crowds who`ve come to see Rod Stewart – Rock Star. He says he can no longer combine the two lives. In many ways Stewart is remarkably unassuming. He`ll talk about football but don`t expect any great insights into the state of the world or more etherial subjects. He`s interested but doesn`t see that he or any other artist should know more about it than anybody else. “You`ve got to be honest and admit that the level of intelligence among rock musicians is not all that high. I`m not saying they`re all idiots, but, generally speaking, most musicians come from a working-class background so why should they particularly know what`s going on? Also, Stewart is not particularly interested in the supposed new rock phenomena: decadence. “Each to his own, y`know. I don`t think I live a particularly evil life but I don`t allow myself to get bored either. I suppose I come in between the two. How does he feel about Ian McLagan once describing him as “a bit of an old folkie at heart”? But doesn`t a certain amount of spectacle on stage help to sell records? “Yeah, I think maybe it half-sells them. Like, I think I`ve been flash since I left school but I do think I`ve got a pretty good voice as well. You can`t forget that. “I mean, there was a time when I was with Beck that I used to hide behind the amplifiers and my voice hasn`t improved that much since then. It`s just audiences – and audiences, particularly in America, have brought me out of myself on stage. “I really need an audience – the bigger the better. It`s a great boost to the ego – that`s something that everybody needs. “Also, I need to be told how good I am. And everybody needs that. Did anyone ever read this ad through from start to finish? 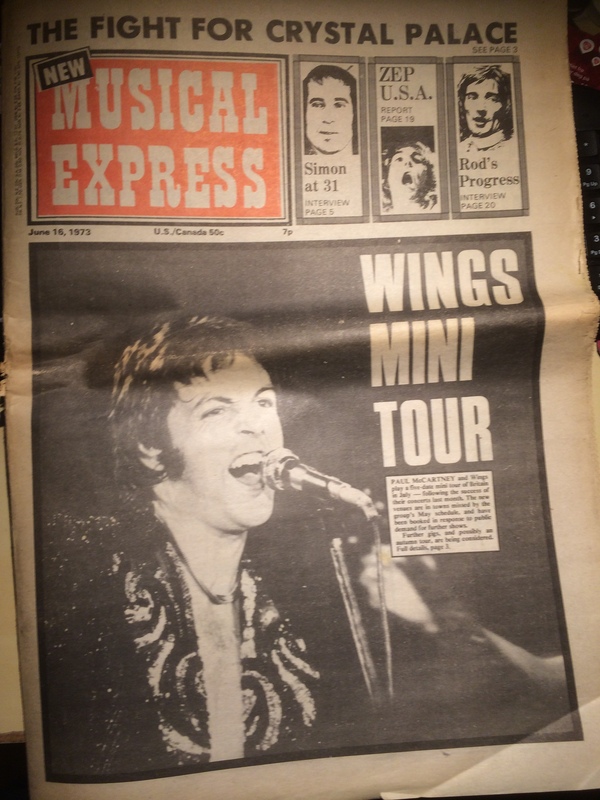 This number of the NME also contains articles/interviews with these people: Terry Reid, Jimi Hendrix, Paul Simon, Gilbert O`Sullivan, Fleetwood Mac, Edgar Winter, Led Zeppelin, John Entwistle, Jimmy McCullough, Marc Bolan, Nickey Barclay.